The MR crew always look forward to the Clipsal 500 round. Even more so this year as it was the first chance to see if our pre-season development program had been as effective as we had hoped. We won the round there in 2012 with Alex Davison and have always enjoyed solid results around the unforgiving streets of Adelaide. Luffy’s new N2C/ Phase 8 car was a bullet all weekend. After qualifying third behind team-mate Shae Davies and Steve Richards, Luffy produced a perfectly weighted drive to survive the trials and tribulations of lapping back-markers. He then held a blow torch on the back of Richo forcing an uncharacteristic mistake. Once in front Luffy put his head down and apart from some close attention from Shae in the final laps, almost cruised to the first victory of the new 991 generation Cup Cars. In race two Luffy had a demon start from the outside of the front row and drove a great race to head home Foster and McBride. Race three saw Luffy get a great jump off the line and simply drive away from the field in a dominant display. This was the first clean sweep in Carrera Cup at the Clipsal 500 since 2004. Shae had a shocking weekend. Despite being on pole and leaving the Adelaide venue with the lap record, his race results didn’t come close to representing his raw speed. Shae led race one until blocked by a backmarker in an atrocious display of a slower car not respecting the leaders. He dropped to third, got back to 2nd after Richo’s spin then clipped the wall at turn 11 chasing Luffy, which damaged the front of the car and dropped him to 11th. Race 2 was a great drive and showed Shae’s true speed and hunger in catching and passing Baird and Patrizi and capturing the lap record on his march from 11th to 5th. In race 3 Shae had moved up from fifth and was passing for third when contact with Foster bent his steering and he dropped to 9th place. So much promise unrewarded. ‘Wallsy’ did a great job in the first round of only his second year in car racing. Having learned the tracks last season, we were always confident TW was going to make huge improvements, which he did. Being an extremely competitive character, and never happy until he wins, we are very impressed with his progress despite copping some damage from unsportsmanlike driving from a few of his competitors. This included the team needing to replace a chassis rail in the back of his car in Friday night after race 1. We are quite certain Wallsy will be on the Elite podium in the very near future. He loves the fast flowing nature of Albert Park, so that may happen quite soon! 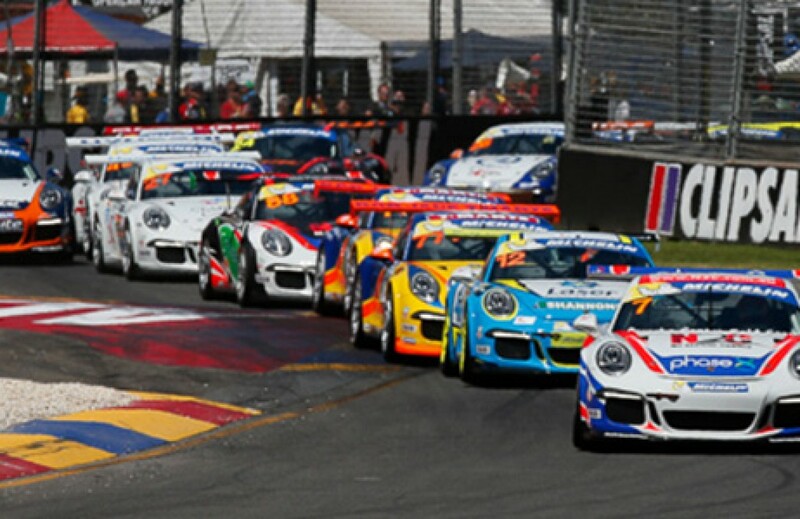 Like Wallsy, ‘Princess’ has made great strides since the end of her first season in Carrera Cup. Despite a very limited testing program due to electrical issues with her new car, her gap to pole position was 3.95 secs compared to 7.09 secs last year and her gap to the fastest race lap was 3.11 secs compared to 5.46 last season. She is becoming more assertive in racing situations which we will continue to work on, along with her aggression on the first lap. Although we were happy with Renee finishing every race lap in the top 18, in a 23 car field, we are expecting Princess to run in the top 15 at the AGP in two weeks. We are rapt to start the season with Luffy’s three wins and Shae’s pole and lap record which validates the work the awesome crew have been putting in over the break and in pre-season testing. Tony & Renee have made the improvements we are after, so we can’t wait to get stuck into the next round; the F1 AGP at Albert Park. But we are off the Eastern Creek to run 6 cars in GT3 Cup Challenge at the Top Gear festival, between Clipsal & the AGP! Thanks to all our supporters and stay tuned, we have plenty more to come in 2014..! !